These four little specials are so cute. At five minutes each they're a perfect filler between episodes. Usagi Drop has been named as a slice of life anime, well these little shorts are like a slice out of that first slice of life! I think these episodes followed on beautifully from the parent anime, the sound and the style seemed the same to me, as did the characters. Of course in five minutes you can't always expect the same character development from what you get from something twenty minutes long. Although I would have loved to have seen something like the Episode 3.5 "Dear My Santa Claus" developed into a longer Christmas Special it was still really beautiful. But at the same time those Christmas Specials are done by everyone these days so in a way it was probably best they kept it short and sweet and only showed another reference of the care, respect and love Rin and Daikichi have for one another and how they react to another new event in their new relationship. I'm going to end my review by mentioning that making these short episodes was a much better idea than trying to condense these extra scenes into the parent anime and I'd definitely watch them again and again, just like I will the main Usagi Drop episodes. 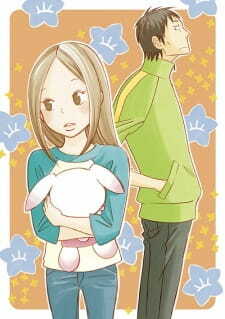 Usagi Drop is one of the best slice of life animes around. It depicts the relationship between a foster parent and daughter accurately while tellling an entertaining and in depth story. These four short specials complement the series, providing some extra content to fit in between some of the episodes. At five minutes per special, there isn't much time given to develop an in-depth story. Instead, the focus of each special is on a certain event or moment in Rin's life, for example; leaf collecting. Each special manages to capture the essence of the parent series. While they're short, they're exactly what you would expect after watching Usagi Drop. Rin and Daikichi's relationship is still at the center of the show. The comedy is still there, but so are the beautiful touching moments that fans of Usagi Drop have grown used to seeing. If you enjoyed the parent series, then these will please you. The visuals, soundtrack and voice acting are the same as before and the quality is just as high. The only negative is that there isn't any sign that there will be any future specials like these. After you finish the parent series, definitely watch these. Fantastic little short episodes which bookend a handful of episodes, best watched in sequence with the series proper, as they extend the narratives of the corresponding episodes. I enjoyed how each one corresponded to seasonal shifts in line with the main episodes' progression of seasons, as was shown in the end credits for the specials and episodes proper. The seasonal progression over the course of the series was a similar aesthetic to what Production IG did with the credit sequences in Kimi ni Todoke with seasonal shifts shown through art in the credit rolls, definitely a nice touch to help show time progression in a subtle way. I'm going out on a limb here and writing this based on the first Special, "Aquarium of Leaves". I loved the manga and almost flipped when I found out that they were going to do LAM and an animé. At the same time, I was somewhat leery of them taking too many liberties and ruining something I cherished. When I found out that they only had the go-ahead for one (half) season, I wondered if they were going to super-compress the story or restrict themselves to the first portion. But I'm not writing a review of the parent series, in spite of how it seems at the moment. I truly enjoyed the animé and rewatch episodes often. The reason I blathered on so much about the parent show was to point out that these specials (the first episode, at least) are what most would consider "filler" or "non-cannon". They don't appear in the manga. That being said, I think the first episode followed the spirit of the manga and animé very well, adding spice to an already tasty dish without distracting, overwhelming, or being so bland as to be unnoticable. The art and sound seemed to be comperable to the parent without cutting corners. The characters seemed the same even though I thought Daikichi didn't come across quite as belligerently clueless as he does in my favorite parts of the manga and parent show (which is why I marked "Character" down). The thing which stands out most clearly for me was the story. I thought it carried the same feel as the manga and the parent animé (which follows the manga so closely) while giving us a fresh peek into Rin and Daikichi's lives. From her creativity to his acceptance and encouragement of it, it's as sweet as my favorite parts of the parents which birthed this little gem. It's a very enjoyable "day-trip" back to a place I had feared was old ground. Enough of the familliar to make me feel at home, but with with so much new and novel to keep me interested and immersed. It definately left me wanting more (MUCH more), but not at all dissatisfied with the brief visit I got to spend with Rin and Daikichi.